I have not seen such a desire for going to America since 1847 as there is at present. The people have almost despaired at being able to live in Ireland. 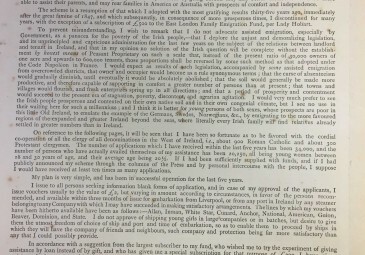 As part of our series: From the Archives: Public History, Hayley Kilgallon examines a report written by Vere Henry Louis Foster (1819-1900) regarding the assisted emigration fund he founded and managed. The report, published in October 1884, highlights the hardship in Ireland at the time and the desperation among people to emigrate. It also gives an insight into how Foster operated his scheme. 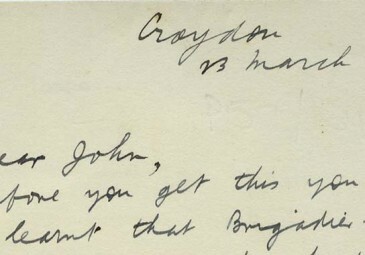 Four letters of Vere Foster to Mr. O’Brien, 1884 and 1886, with associated printed items – cuttings, etc. dealing with aided female emigration from the west of Ireland and associated topics. These were the words of one parish priest in Co. Leitrim, such was the distress in the West of Ireland in the early 1880s. Widespread failure of the potato crop, high rents, a lack of seasonal migration opportunities coupled with over-population and continued sub-division of the land meant that starvation, eviction, and all-out destitution were very real threats once more. 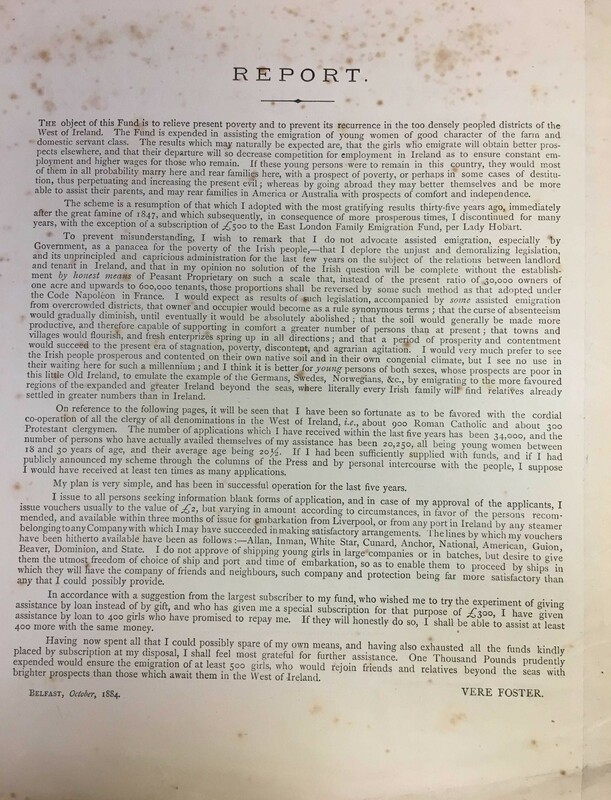 This month’s ‘From the Archives’ piece examines a report written by Vere Henry Louis Foster (1819-1900) regarding the assisted emigration fund he founded and managed. The report, published in October 1884, highlights the hardship in Ireland at the time and the desperation among people to emigrate. It also gives an insight into how Foster operated his scheme. Foster was born into a wealthy aristocratic family and initially followed his father into the diplomatic service, serving as an attaché in Rio de Janeiro, Buenos Aires and Montevideo between 1842 and 1847. Following the death of his father in 1847, Foster visited his father’s estate in Co. Louth and became concerned with the plight of the Irish poor. From then on, and with the aid of a newly-acquired and plentiful inheritance, Foster devoted his life to philanthropic endeavours. 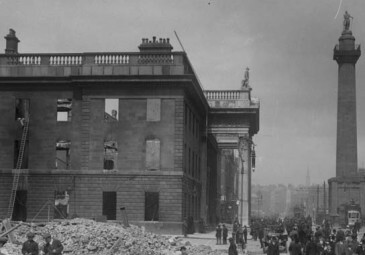 Apart from establishing an assisted emigration fund, Foster also agitated for better conditions on passenger ships, sought better treatment for teachers, and became the first President of the Irish National Teachers’ Organisation (INTO). Foster’s prosperous background makes his humanitarian nature quite remarkable, but even more so considering he contributed approximately £50,000 to his Irish Female Emigration Fund from its inception in 1849 to its conclusion in 1889. Living frugally for most of his life, he had just £75 to his name when he died in 1900. 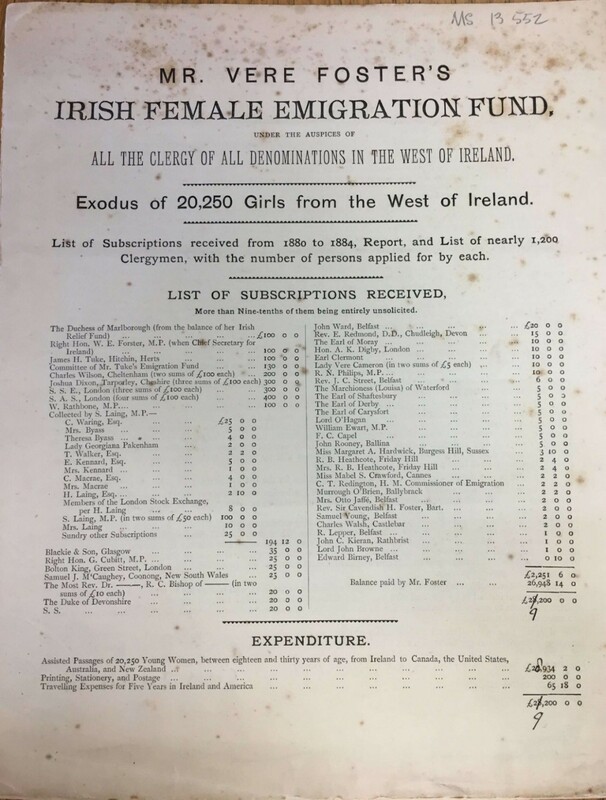 The Irish Female Emigration Fund was a private fund and was first established by Foster in 1852. It was revived in 1880 with the aim of assisting ‘young women of good character of the farm and domestic servant class’ between the ages of eighteen and thirty. A simple scheme in which travel vouchers worth up to £2 were issued, this allowed a staggering total of 20,250 young women (from 34,000 applications) to emigrate between 1880 and 1884. The total cost of this scheme during its four-year revival was £28,934, of which Foster contributed £26,948. No government aid was received to support the fund and more than more than nine-tenths of the subscriptions received were unsolicited. A number of high-profile figures donated to the fund including the Duchess of Marlborough, Frances Ann Spencer-Churchill, the grandmother of future British Prime Minister Winston Churchill. 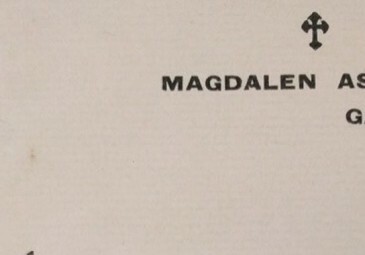 She donated £100 from the balance of her Irish Relief Fund, as did W.E. Forster MP and Chief Secretary of Ireland 1880-1882. Foster deliberately reserved the scheme for women because he believed that if young women were to stay in Ireland, marry and raise a family, they would likely remain in poverty for their entire lives ‘thus perpetuating and increasing the present evil’. Greater employment opportunities existed for young women in America and Canada, and by sending money home they could ease the hardship of their parents. 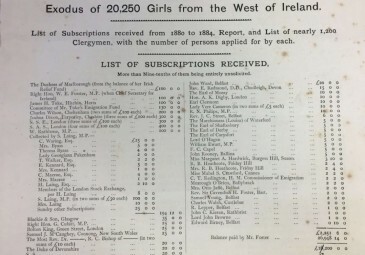 This exodus centred around eight western counties – Donegal, Galway, Leitrim, Mayo, Roscommon, Sligo, Clare and Kerry – however, Foster also received requests from a further twenty-two counties. Applications were received through local clergymen, of both the Catholic and Protestant faith, who wrote to Foster despairing at the ‘wretched existence’ of their parishioners. One parish priest, of Moyrus and Clifden (Co. Galway), stated that ‘penal servitude would be a paradise to many of them compared to their present condition’ and reflected the sentiment of the parish priest of Carna (Co. Galway) who remarked that ‘there could not be a greater act of charity done than sending them to America’. Letters sent to Foster reassure him that the young women had settled in well overseas and had been comfortable enough to send money home. These positive reports suggest that the fund was successful in relieving these young women from poverty. This surely encouraged Foster to make a request in this document for additional funds of £1,000 to continue his work. However, Foster did not view assisted emigration as a panacea to Irish poverty and he opposed the emigration of whole families for fear that it would lead to the de-population of the country. That said, he considered it to be the most practical means of providing both immediate and long-lasting relief in times of crisis. 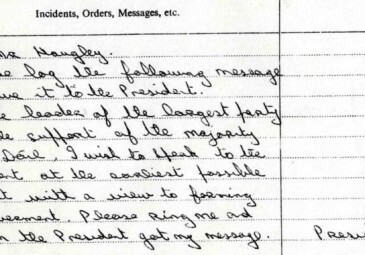 ‘I would very much prefer to see the Irish people prosperous and contented on their own native soil’, he comments in this document, ‘but I see no use in waiting here for such a millennium’. Evidently, Foster was frustrated by the lack of relief measures available to the people of Ireland. By October 1884 the fund was empty but the yearning to emigrate remained. Foster’s program was just one of many assisted emigration schemes in this period. The comprehensive and detailed nature of this report gives us an insight into how and why this fund was established. More importantly, however, it informs us about Irish society in this period. From Cork to Donegal, whether Catholic or Protestant, this crisis extended across the whole island and did not differentiate between religious affiliation. Since the time of the Great Famine 30 years prior, the Irish poor were continuously forced to make the transatlantic journey in search of a better life. Desmond McCabe, ‘Foster, Vere Henry Louis’, in, Dictionary of Irish Biography, ed. James McGuire and James Quinn (Cambridge, 2009). Mary McNeill, Vere Foster 1819-1900: An Irish Benefactor (Newton Abbott, 1971). Gerard Moran, ‘Near Famine: The Crisis in the West of Ireland, 1879-82’, Irish Studies Review 5, no. 18 (1997), pp 14-21. Gerard Moran, Sending out Ireland’s poor: assisted emigration to North America in the nineteenth century (Dublin, 2004). Four letters of Vere Foster to Mr. O’Brien, 1884 and 1886, with associated printed items – cuttings, etc. dealing with aided female emigration from the west of Ireland and associated topics. Ms 13,552, National Library of Ireland. 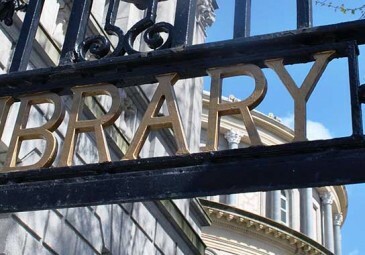 History Hub gratefully acknowledges the permission of the National Library of Ireland to republish this item.